Offbeat Eats Food-related ramblings from an oft-traveled engineer. Reviews, pictures, and directions. The North Shore of Oahu is known for several things. The primary one is surfing; during the winter months, the beaches of the North Shore such as Ehukai Beach (better known as “Banzai Pipeline”) and Sunset Beach feature large smooth swells. The area is also known for natural beauty (like Waimea Bay and Waimea Valley). But a single drive through the region will also show you that the area, particularly around Kahuku, is well known for another thing: Shrimp stands. Between Punaluʻu and Sunset Beach are a quite a few stands and trucks selling you shrimp. 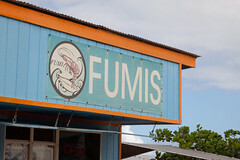 Some of these have quite the following, such as Shrimp Shack (Punaluʻu), Macky’s (Haleiwa), Giovanni’s, Fumi’s, and Romy’s (the last three of these all in Kahuku, and the style is often called “Kahuku shrimp”). Thus, stopping for shrimp is a popular pastime in both the surfer and tourist communities. For our visit, we decided to give Fumi’s a try. Fumi’s is actually a pair of places. One of them is a shrimp truck between Kahuku and Laie. The other is a short distance away (walking distance down the Kamehameha Highway) in a converted farm stand. We ended up visiting the latter, due to shorter lines and more available seating. However, it’s obvious why Fumi’s (and their competitor Romy’s, at a near-identical stand a quarter mile down the road) are located here: this stretch of Kahuku consists primarily of shrimp farming, with pond after pond of shrimp ponds in which shrimp are farm raised, and the shrimp stands provide a nice local outlet for the product. Interestingly, however, the area stands don’t all sort from here. Fumi’s and Romy’s apparently do, at least most of the time, while some of the others (Giovanni’s, in particular) source theirs from salt-water sources, using frozen shrimp. But in any case, all of these joints involve shrimp, generally served up in a butter sauce (with optional garlic and hot pepper) alongside some rice. There’s not a lot of menu options at Fumi’s: it’s basically all shrimp. 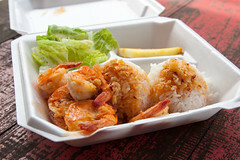 We settled on their most popular item: the hot and spicy garlic shrimp, served up in a rich buttery cayenne and garlic sauce with two big scoops of rice (at times in Hawaii, it’s hard to avoid rice, it’s everywhere), some pineapple wedges, and a small green salad. The real key here is the shrimp: your order contains a half dozen really large, nicely cleaned and de-veined, but still shell-on shrimp, but the shells are so light and nicely cooked that you can eat them as well. The shrimp itself is cooked perfectly, without overcooking or mushiness, for the perfect shrimp texture. The spiced garlic butter sauce is a perfect complement for both the shrimp and the rice. The salad and pineapple, while almost an afterthought, do add a nice dimension to making this a meal instead of just a “rice and shrimp” snack. All in all, Fumi’s does exactly what they set out to do: provide quality shrimp at a reasonable price, and doing so with the utmost in shrimp quality. I wouldn’t hesitate to come back. While there is a lot of shrimp truck competition, Fumi’s holds their own. A few weeks ago I was driving to upstate New York, which involves the rather difficult process of negotiating Vermont, which lacks major East-West highways (while I love the scenery of Vermont, if they ever wanted to create an interstate heading across the state from either Bennington or Rutland, I wouldn’t complain). This time I went on Highway 7, passing through Chester, and used it as an excuse to visit MacLaomainn’s Scottish Pub, which I had noticed on several recent trips, but never had reason to stop in. Being 1pm and my not having lunch, stopping in for a late lunch seemed to be the order of the day.